This pamphlet is designed to help people with age-related macular degeneration and their families better understand the disease. It describes the causes, symptoms, diagnosis, and treatment of age-related macular degeneration. How does Age-related Macular Degeneration (AMD) damage vision? 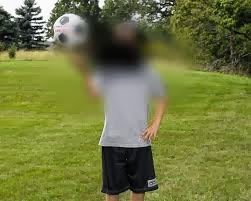 What are the types of Age-related Macular Degeneration (AMD)? 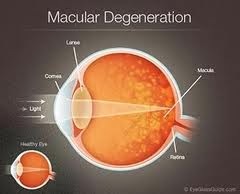 There are two types of Age-related Macular Degeneration (AMD) – the dry (atrophic) form and the wet (exudative or neovascular) form. The dry form of AMD affects about 85-90 percent of AMD patients and usually begins when tiny yellow deposits called drusen appear in the macula. Drusen usually do not cause serious loss of vision, but can distort vision. However, for reasons that are not yet understood, sometimes drusen are associated with macular atrophy (thinning) and tissue breakdown, slowly leading to vision loss. Patients may have blind spots in their vision; in the advanced stages, patients may even lose central vision. The wet form of AMD occurs in about 10-15 percent of AMD patients. It is caused by the growth of abnormal blood vessels beneath the macula that can leak fluid and blood into the eye. The wet form of AMD usually causes major vision problems, such as blind spots and loss of central vision, in the affected eye, and can advance rapidly. These abnormal blood vessels eventually scar, leading to permanent retinal damage and loss of central vision. Most patients with AMD have the dry form of the disease and will not lose central vision. However, the dry form of AMD can lead to the wet form. People who have the wet form of AMD are much more likely to have serious vision loss. For these patients, early diagnosis and treatment are important to save as much vision as possible. Age-related Macular Degeneration may be hereditary, meaning it can be passed on from parents to children. If someone in your family has or had the condition, you may be at higher risk for developing the disease. Talk to your eye doctor about your individual risk. Who is at risk for Age-related Macular Degeneration (AMD)? Smoking: Smoking may increase the risk of AMD. Cholesterol: People with elevated levels of blood cholesterol may be at higher risk for wet AMD. How is Age-related Macular Degeneration (AMD) detected? How is Age-related Macular Degeneration (AMD) treated? Dry AMD currently cannot be treated. But this does not mean that you will lose your sight. Fortunately, dry AMD develops very slowly. You may lose some of your central vision over the years. However, most people are able to lead normal, active lives--especially if AMD affects only one eye. Laser surgery is performed in your eye care professional's office or eye clinic. 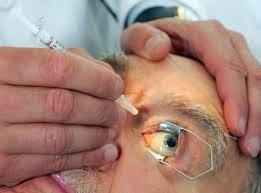 Before the surgery, he or she will: (1) dilate your pupil and (2) apply drops to numb the eye. In some cases, he or she also may numb the area behind the eye to prevent any discomfort. If you have dry AMD, you should have your eyes examined through dilated pupils at least once a year. This will allow your eye care professional to monitor your condition and check for other eye diseases as well. 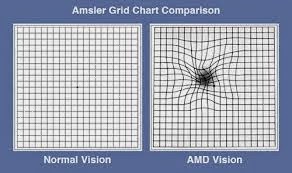 You should also obtain an Amsler grid from an eye care professional to use at home. This will provide you with a quick and inexpensive test to evaluate your vision each day for signs of wet AMD. It works best for people who still have good central vision. You should check each eye separately--cover one eye and look at the grid, then cover your other eye and look at the grid. You also may want to check your vision by reading the newspaper, watching television, and just looking at people's faces. If you detect any changes, you should have an eye exam. If you have wet AMD, it is important not to delay laser surgery if your eye care professional advises you to have it. After surgery, you will need to have frequent eye examinations to detect any recurrence of leaking blood vessels. Studies show that people who smoke have a greater risk of recurrence than those who don't. What can I expect after drug injection treatment? After treatment, your physician may order another OCT picture, or sometimes an angiogram, to make sure there are no other areas of blood leakage. If the OCT shows that there is still leakage, more treatment is usually recommended. Are there any side effects of the anti-angiogenesis eye injections? in very rare instances, retinal detachment or severe loss of vision may occur. In studies, 1 to 2% of patients receiving the drugs had a heart attack or stroke over the next year, which appears to be a similar rate to that seen in the control group of patients. Can treatment help if I am legally blind? Depending upon the cause of legal blindness, it is possible that treatment may help. If recent bleeding or leakage under the retina has resulted in legal blindness, surgery is a possibility. Retinal cell transplants and stem cell therapy are under study; a new implanted electronic retinal “chip” was recently approved for human use and may be an option in highly selected cases. Can I have treatment if lasers were used as an earlier treatment? Because bleeding or leakage may occur beneath the retina even after the laser treatment, it is possible that treatment with injected drugs can help. I have other medical conditions. Can I still have treatment? Other medical conditions or age should not be a factor if you are considered an appropriate candidate for treatment, although sometimes anti-VEGF injections may be delayed after a recent heart attack or stroke. What is the outlook for people with Age-related Macular Degeneration (AMD)? Unfortunately, AMD can return even after successful treatment. The various treatments can slow the rate of vision loss and hopefully preserve some sight.